Please do not plow, push, or blow snow from driveways into the street. Not only does is create a potential danger, but NYS vehicle and Traffic Law prohibits these deposits in a public street. If you are following a snowplow or salt truck remember to stay at least 100 feet back as the vehicle will frequently back up. If you cannot see the driver of the plow – he cannot see you either. Mail Box Policy - It is the Village Highway Department's policy to replace mailboxes that are damaged by the Village during snowplowing operations with a standard rural mailbox and 4'x4" wood post. Since there is not statutory or legal authority which grants a property owner or resident along a public highway the right to place a mailbox in the highway right-of-way, replacement of mailboxes is done as a courtesy and only the standard replacement can be provided. Lawn Repair – Lawns at the road that are damaged by plowing will be repaired in the spring once all threat of snow has passed and topsoil becomes available usually at the end of April or beginning of May. Village workers will put in top soil and seed as time permits. 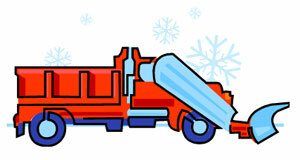 Snow Bank tunneling danger – Please do not allow your children to tunnel into roadside snow banks. Snow bank tunneling is very DANGEROUS. The tunnels can collapse or snow plows could hit or bury children in the tunnels. Please discourage roadside snow play. Fire Hydrants - Please help maintain fire hydrant accessibility to the fire hydrant nearest your home or place of business. Shoveling snow away from the hydrant will help maintain accessibility to the hydrant in the event of a fire.